Portrayer: Alice Barrett-Mitchell, April 14, 1989 - August 29, 1996; June 17 and 25, 1999. Arrival: Came to discover who killed her uncle Jason Frame. Introduction Scene: Frame kitchen, to Sharlene Frame, "It's you, isn't it? Yeah, it is." Exit Scenes: (1996) The Cory icehouse, to Fax Newman, her killer, "I beg of you. I have a child." (1999) To her daughter Charlie Frame Winthrop in Foster Park, "The best, just like you." Date of Death: August 19, 1996. Cause of Death: Strangled by Fax Newman. Place of Death: The Cory icehouse. Frankie's mother, Emma Frame Ordway, was a mainstay in Bay City in the late 1970s. She made only one appearance in recent years, and that was to attend her daughter's wedding in 1990. Emma was often mentioned. Emma was often referred to as the "overbearing mother." Although Frankie was close to her mother, she didn't appreciate her mother's interference. Emma lives in Oklahoma, and Frankie frequently visited her there. In 1995, Emma suffered a stroke. Frankie and she were able to put a lot of bad feelings behind them when Frankie came to help her mother recuperate. Frankie's father, Burt Ordway, appeared on AW in the 1970s, but was never mentioned during Frankie's time. In February 1994, Frankie had her first child, a daughter named Charlotte "Charlie" Frame Winthrop. Charlie was born with a heart defect. She had surgery two months after her birth, and while she is all right at present, her health is in constant danger. Frankie also miscarried twice, in 1991 and in 1995. Molly Ordway. Frankie's younger sister Molly lived in Bay City in the late 1970s and has not been back to town since. She was last mentioned by Frankie when Emma had her stroke in 1995. Frankie has three brothers, Henry, Wade, and Sterling Ordway, who were mentioned but never seen in the 1970s. Wade, whose birthday is in mid-September, was about 10 in 1975. Steve Frame (RIP), uncle. Willis Frame, uncle. Vince Frame, uncle. Jason Frame (RIP), uncle. Janice Frame (RIP), aunt. Henry Frame, uncle. Sharlene Frame, aunt. Norman Frame, uncle. Jamie Frame, cousin. Evan Frame, cousin. Josie Watts, cousin. Gregory Hudson, cousin. Dean Frame, cousin. Steven Frame, second cousin. Gary Sinclair Jr. (RIP), second cousin. Destined to become good friends only, Frankie and Derek did go out on a friendly date in 1989. 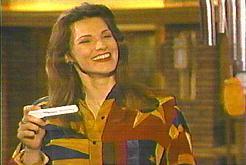 In 1991, Frankie became pregnant by her lover Cass Winthrop. She didn't tell him of her condition because they had been separated when she found out. In her third month, she miscarried the baby. It was due to no fault of her own. Later that year, Frankie was caught in an explosion engineered by Carl Hutchins. At the hospital she was declared clinically dead. In scenes supposedly shot in Heaven, Frankie begged to be able to live again. With her family and friends around her, Frankie came back to live. She suffered no ill effects of the experience. In 1995, Frankie went through the horrible experience of losing another baby. In 1993, Frankie was accused of assisting her best friend's husband, Douglas Carson, commit suicide. In reality, her best friend, Christy Carson, had murdered her husband and framed Frankie for the assisted suicide. During the trial (in which Frankie was represented by her husband, Cass Winthrop), all of Christy's dirty deeds were revealed and she was taken off to jail. Frankie was the resident private investigator, having been mentored in Chadwell by a P.I. named Bob Buchanan. She investigated several crimes over the years and was even responsible for clearing up the Jason Frame murder mystery. She once formed a partnership with Ryan Harrison during his stint as a private investigator. Frankie often helped the police out with their investigations, usually on an unofficial basis. It was not surprising to see her occupying a desk at the Station House, even though she was not on the payroll. While working undercover in 1989, she spent several months working as Lucas's personal assistant. In 1995, she opened up a detective agency with Joe Carlino. Joe left after a few months to return to the police force.